This week's selection that I can't wait to read is Beautiful Days by Anna Godbersen! 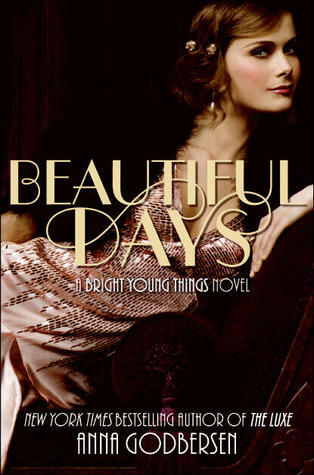 Goodreads Summary: For the bright young things of 1929, the beautiful days seem endless, filled with romance and heartbreak, adventure and intrigue, friendship and rivalry. I absolutely loved the first book in this series, Bright Young Things, and can't wait to read this sure-to-be exciting sequel! I love the three girls who are the main characters -- they're all so exiting and fun to read about. Also, if you're interested in winning a copy of Beautiful Days (along with a copy of my debut novel, Remembrance), then please check out the Bright, Young, and Luxe Giveaway on my blog that ends on the Beautiful Days release day! Great to go over the post here. It was so informative. Some points described here were new for me and it was actually wonderful to go through such informative post. I like your write work manner and language. I am a beginner in writing. I believe this will help me to write better. I exposed these blog articles are superior to other blogs. You can have a peek over the top essay writing service to know about the best essay writing services.